The Brunckow Cabin takes its place in early Tombstone history. It was actually where the first Tombstone Mine was sunk. Even though others get the official credit. We pass its namesake road all the time on our way to Sierra Vista to do some shopping. We discuss the town's history with other locals, plus read historical books which mention it. So our curiosity was riled up! That's why we wanted to look further into these mysterious ruins. It all began with Prussian-born Frederick Brunckow, an honors graduate of Berlin's Royal Mining Academy. After getting some practical mining experience in European gold and silver mines, he immigrated to Texas in the mid 1850s. In 1856 he came to Tucson AZ, employed by Cincinnati's Sonora Exploring and Mining Company. By 1857 he became their Field Geologist and was sent to investigate areas East of the Huachuca Moutains. He noted mineral evidence in the San Pedro River Valley. Panoramic View with the Brunckow Cabin ruins. By 1859 Brunckow decided to create his own venture, the St. Louis Mining Co. He recruited partners James Williams, a machinist, his brother William, and chemist J.C. Moss. They hired mine laborers out of Sonora, Mexico. Their company started out successfully. A shaft into the ground was opened and an adobe furnace constructed to produce the silver ore. They built adobe homes for their workers and the families - all told about 20 people. A store was built, completing this small village. The Sonoran mine laborers began a violent revolt on July 23, 1860 - ending the era of this mine's success. They killed Brunckow by plowing a rock drill into his gut and throwing him down the mine shaft. Moss & James Williams were found dead in a store-room. William had gone for supplies at Fort Buchanan, forty miles away. He discovered the bodies upon returning. He realized the cook, David Bontrager, was missing. In terror, William Williams quickly retraced his path to Fort Buckanan. Troops were sent to the Brunckow Cabin to investigate. They buried the bodies in unmarked graves. David Bontrager suddenly reappeared to explain he was taken captive by the Mexican laborers. He said they finally released him because he was Catholic. At first though, the soldiers held him under suspicion in the murders. Fort Buchanan officers contacted Mexican authorities, who investigated the incident. They confirmed Bontrager's story and were able to return some stolen equipment. The culprits were never arrested. Bontrager was released. When Brunckow worked for Sonora Exploring and Mining Company he earned a yearly salary of $1800, quite high for those days. Upon starting his own company, was he so ambitious that he became the type to use and abuse his laborers? Consider the old time traditional song: "I owe my soul to the Company Store" which tells that type of story. That Was Only the Start of Its Sordid History! No one continued that mining operation immediately afterwards. It was rumored that the Brunckow cabin became a meeting point for smugglers. Interestingly a Census taken in 1864 for Arizona Territory organization found that 3 Hispanic laborers were residents there. They stated they moved from New Mexico, but the interview wasn't completed and was scheduled for a return visit. It was never done. Milton A. Duffield was a real estate speculator, who'd first come West in the California gold rush of 1849. He then came to Arizona, and was appointed its first U.S. Marshall when it became a U.S. Territory. He held that position for about 2-1/2 years. He was a large man, known as a hard drinker who liked to show off his macho muscles and gunplay. He picked up real estate around Southern Arizona, and apparently acquired claim to the Brunckow Mine. But he had a lot of creditors. So to protect his interests, he transferred his ownership of the mine to his housekeeper's name. It was registered to Mrs. Mary E. Vaughn. Edward N Fish Also Makes a Claim! Edward N. Fish was a merchant, who invested in land with others. This group made claim to the Brunckow cabin and mine. Fish sent his employee, Joseph Holmes, up to the mine to take residence in one of the adobe cabins. On June 5, 1874 Duffield decided to ensure his claim. He'd made it known he would kill anyone who tried to impinge on his mine claim. But he was unarmed as he entered the cabin. Holmes killed Duffield with a shotgun. Duffield was buried near the others killed there, in an unmarked grave. Holmes was found guilty of voluntary manslaughter. Imprisoned, he escaped after 17 days! He was not pursued and never held accountable. Soon thereafter, Mary Vaughn thought to exercise her claim to the property. She put up a trespass notice and publicized her Pima County filing. She was pressured to give it up, and she gave in - vacating the claim. Fish also was exposed to public pressure and did not pursue his supposed claim. A local Tucson resident, who gathered great power and wealth since coming out West, was the next Brunckow claimee. In late 1875, Sidney R. DeLong filed a relocation notice with 2 partners, N.M. Rogers and Tom Jeffords. This enabled them to get title to the property. They began working the mine, employing laborers. Rogers was subsequently killed by a band of Apaches, as was 2 others in nearby Valleys in other incidents. Apache attacks interrupted the mining in that area. DeLong also then developed mining interests in Dos Cabezas AZ. This was closer to the protection of Fort Bowie. DeLong's Brunckow claim was still being worked as late as 1877 when Ed Schieffelin began surveying the Tombstone area. In August of that year, Ed wanted ore samples evaluated from 2 of his first 3 area claims: Graveyard 1 and Graveyard 2. He brought them to DeLong for his opinion. A view up the hill at the Brunchow Cabin Ruins - A lonely, ghostly spot in the Chihuahuan Desert. Already we've learned of the terrible killings there. All happening not too long after the cabin area was first built and mining began. Frederick Brunckow found murdered, along with his two associates. They were buried there. Another kidnapped. Then as a result of an ownership dispute, Milton Duffield was also killed and buried on the property. Brunckow Cabin is known for Ghostly happenings! These events didn't escape notice of the residents of Arizona Territory. Newspapers built on this reputation and noted rumors of strange phenomenon reported in the area of the Brunckow Cabin. Newspaper accounts also told of many other killings there. They revealed these happened in this area between 1860 and 1881, as many as 17 more! A May 20, 1881 issue of Prescott's Arizona Democrat wrote about the multiple burial sites that could be found in the cabin's surroundings. The reporter recalled that miners stated they passed up prospecting in the Brunckow site. They'd heard of agonized ghostly apparitions haunting the cabin and grounds. A May 1897 local Tombstone paper published a story about the Brunckow Cabin. It outlined how a bunch of thieves robbed a Wells Fargo stage. They went to the cabin and began fighting over division of their loot. These robbers went so far as a gunfight, and were all found dead inside the building. Wells Fargo recovered the stolen gold. Author Joshua Hawley's 2010 book Tombstone's Most Haunted (currently out of print) outlined his own experience on-site, adjacent to the cabin. With ghost hunting research equipment he recorded a faint voice he made out to say "My girlfriend" or maybe "My good friend." His book also reports on hauntings experienced by others at the Brunckow Cabin. For instance, one person took a photo of the cabin, in which appeared a bluish highlighted ghostly figure. Such is the reputation of the Brunckow Cabin - from its 1800s history until now! The ruins are deteriorating year by year. Everyone that goes there says, better check it out - before the whole area goes back to the dust! Brunckow Road Sign - Near the Eerie Brunckow Cabin! If you locate Brunckow Road, you may think it's a way you can drive to the Brunckow Cabin. Not! No Entry to the Brunckow Cabin Along Brunckow Road - You Can't Drive to It! The Brunckow Cabin is actually further West from where the road turnoff from Charleston Road is located. From Tombstone it's off of Charleston Road, accessed from the West side of Town. Take East Allen Street, make a turn onto Sumner Street to head West, and it automatically turns into Charleston Road. Pull into Brunckow Road. Just into it, look to the right. You'll see a graveled area right inside the fence where you can park. Walk along Brunckow Road, even past the warning sign. It's okay to walk here - it's BLM land. Car travel is prohibited. Walk about one-tenth of a mile, until you see a break in the fence with a big sandy opening. Turn right into this area when a trail begins. Take this trail. Soon on the right-hand side you'll pass another set of ruins - this isn't the Brunckow Mine! Not sure yet what they are - we've not yet investigated this one! And it's not as ancient. Keep on. Probably in about 1/4 of a mile or a little less, you'll cross a major wash. Go directly across, where the trail enters a bit more vegetative, uphill area. Right ahead of you, you'll now see the Brunckow Cabin ruins. Begin heading West past this parking area, on a vague trail that parallels Charleston Road. You'll see 3 telephone poles, just before the 3rd one, another vague trail jogs off to the left - take that one. Eventually this trail widens out, becoming a small wash, and will cross over another wash. Shortly thereafter it splits. Take the left fork. In not too much farther you'll enter a large wash. Follow this to the left. As you look to your right, the Brunckow Cabin ruins will be up over the edge of the wash. Find an access point. There is a relatively easy one down a little ways on the right. Back-country camping is allowed here - a permit is required. Most people have been camping here when reportedly seeing historic Haunted Tombstone apparitions! A few cautions if you plan to take this hike! Check the weather! If there is any chance of storms - winter storms, or Monsoon thunderstorms, postpone this hike. A few washes will be encountered. One is particularly large and you could be endangered by flooding waters! Remember this is the Chihuahuan Desert. No matter the time of year, have enough water with you. If it is the summer - consider if this hike is a wise idea! If temperatures are in the Fahrenheit high 90s or into the 100 range, hiking is not generally advised - listen for cautionary reports on the news! The abandoned Brunchow mine warning! Be cautious about any old mine shafts - there are quite a few around. Be aware of your surroundings and where you're walking. One mine claim after another was located over these Tombstone Hills! They're often fenced off. Do not ever try to enter them, whether they have fencing or not. Always watch for venomous animals. Most will not attack you - scorpions, spiders, Gila Monsters will do their best to stay out of your way. They're typically not out and about in the light of day. If you happen to spot one - just back off and give them a wide berth. 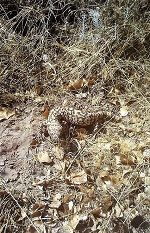 Rattle snakes may surprise you with a warning. Attacks sometimes occur - but are very rare. They will try to warn you. Just walk with awareness of your surroundings. Back away if you see one - they really do not want to attack you. Gila Monsters are protected - they must be provoked to attack. So please, just leave them alone - watch them move away from you from a distance. It's against the law to harm them.